As New Jersey continues to struggle with its poor economy, marked by high rates of unemployment, foreclosures, and an increasing cost of living, the Earned Income Tax Credit (EITC) remains a crucial lifeline for low-income families. 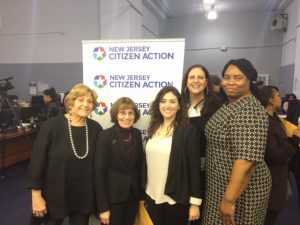 By lifting families out of poverty and giving a boost to local economies, the EITC is a vital tax credit for the more than 600,000 working New Jerseyans who rely on it ‘to make ends meet.’ Unfortunately, many families are unaware that the EITC even exists, or that they are eligible for these tax credits. In other instances, they spend hundreds of dollars paying high cost tax preparers for services that are available for free at Volunteer Income Tax Assistance (VITA) sites. 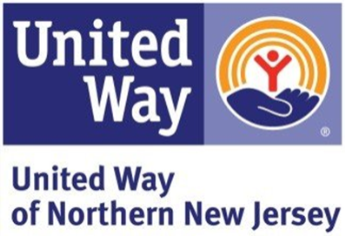 In response to this need, Partners for Health Foundation has once again partnered with NJ Citizen Action, United Way of Northern New Jersey, and HOMECorp to provide free tax preparation services and financial literacy education to encourage community members to take full advantage of their tax credit. 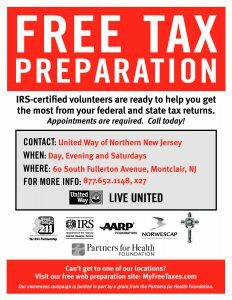 New Jersey Citizen Action (NJCA) will coordinate and conduct a targeted Montclair & Bloomfield Area VITA Project during the upcoming 2017 tax season. 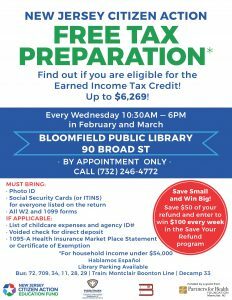 NJCA will staff and coordinate a mobile VITA team of 3-4 tax preparers and quality reviewers to provide free tax preparation at the Bloomfield Public Library on Wednesdays in February and March 2017. Families earning less than $54,000 are eligible for free quality tax preparation, which allows them to receive the fullest extent of the refunds owed to them. This year, NJCA’s Tax office launched the SaveYourRefund incentive program, which promotes tax-time savings. Recognizing that tax refunds are often the largest sums of cash many American households receive all year, the SaveYourRefund program capitalizes on this tax-time moment as an easy method of saving and adds an incentive to nudge filers into opting in to saving for their future. The Savings Specialist will focus on Tax Time Savings for tax payers who are working hard and still struggling save while making ends meet . For the past several years they have implemented a variety of savings incentives, provided savings information, and conducted workshops to introduce financial empowerment tools alongside the tax program. HOMECorp will once again be providing a financial literacy program for VITA clients. VITA clients face a choice: whether or not to use a tax refund to improve their long term financial outlook or to spend it on current expenses. HOMECorp’s financial counseling services are uniquely prepared to help VITA clients make an informed decision that is right for their family. 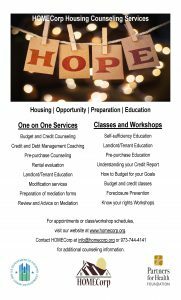 HOMECorp’s financial education services are provided through its H.O.P.E. Program (Housing, Opportunity, Preparation and Education). H.O.P.E. is a financial education toolkit designed to promote the growth of low and moderate income (LMI) communities and strengthen the ability of LMI residents to remain in current affordable housing or purchase a new home. This year HOMECorp will be expanding the EITC counseling to a new population: college students at Montclair State University who have aged out of the foster care system and are involved in the SHIP and Transitions for Youth programs, partnerships between Rutgers and MSU that provide multi-faceted counseling to support these vulnerable young adults. Because most come from backgrounds of poverty, they need to work and take on student loans while in college and have limited financial literacy. HOMECorp has already begun to work with 15 students between the ages of 19 to 28, with annual income ranges from $1,680 to $28,000. HOMECorp will incorporate EITC information into their counseling services. Please see attached flyers for more information on these free tax return and financial literacy services being provided in our area!